Front gardens are under a lot of pressure to make a good impression, and in some areas there are even laws defining what can and can’t be grown kerbside. For the keen food gardener, this can pose a problem – how to make the frontage look appealing while at the same time being productive? Many herbs look great and smell irresistible, making them perfect for appeasing stringent housing association rules (or fussy neighbours) without compromising on making productive use of your garden space. Non-flowering lawn chamomile can even be used to replace your boring old grass lawn (and it needs much less maintenance), or try a flowering thyme for an attractive carpet that will be buzzing with bees. If your lawn is often used as a short cut to your front door, lay stepping stones to avoid too much wear and tear. The entrance to your garden is a great opportunity to use structures to add height and a bit of drama. A hop vine invited to clamber up an archway at your gate or doorway will provide a seasonal vegetable as well as decorative hops cones that can be dried as a great-smelling pot pourri or used to flavour beer (and what gardener hasn’t been tempted to make their own home brew?). Parterres and knot gardens – blocks of plants within an arrangement of low, clipped hedges – were originally used in the gardens of sprawling country houses, but they can be used to great effect on a smaller scale in a formal front garden. The framework of low hedging can be any shape you like, from simple squares to swirling Celtic designs. Fill each segment between hedges with your favourite flowers and herbs, one type of plant in each section. The spiral itself is usually made up of stones, bricks or blocks, spiralling gently upwards. At the base of the spiral is a small pond, which provides a home for moisture-loving plants such as watercress. Slightly above, still in a damp area, is where mints and lady’s mantle are grown. The very top of the spiral is the best spot for sun-loving herbs that tolerate drought, including lavender, rosemary, thyme and sage. Even if you have a tiny garden you can still grow herbs out front. Many herbs are well suited to containers. 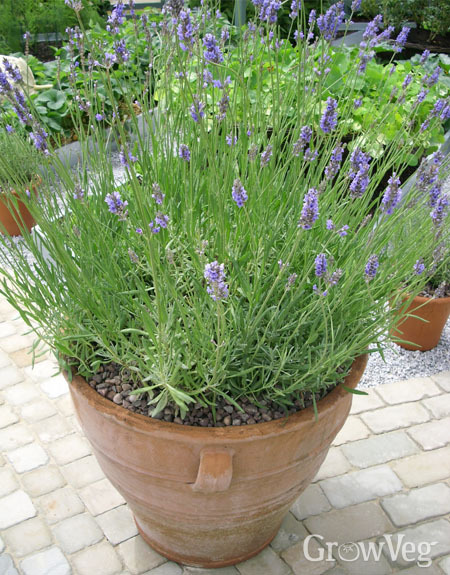 Why not try terracotta or stoneware pots, urns or troughs filled with sage, parsley, basil and mint, or a windowbox dripping with thyme or marjoram? Grow your favourites closest to the front door so it’s no bother to nip out and quickly snip off what you need for your next meal. What are your favourite ways to use herbs in your front garden? Drop us a comment below and share your tips for planning and planting a fabulous, productive herb front garden!